This view looks across Bikuni Bridge (toward Sukiyabashi Gate and the current Sukiyabashi intersection), where a laden porter is approaching the street beyond where a fire tower rises up. Snow is falling from the deep indigo sky. On the further side is a man with his head buried in his umbrella. In Hiroshige's day, Bikunibashi (Nun's Bridge) was associated with the bikuni, a type of low-class prostitute originally disguised as a nun. The bikuni, who were of a slightly higher grade than the yotaka (seen in print 105 of the series), worked in cheap, unlicensed brothels known as bikuniyado, several of which were reported to have been located in this area. On the right is a stall selling roasted yams, a winter favorite in Tokyo; the lantern advertises maruyaki, or "roasted whole." Baskets of yams lie on the ground outside, near a dog and her puppies. On the left is a shop offering "mountain whale" (yamakujira - meat of wild animals). In an earlier period Buddhist law prohibited the eating of animal meat, but this taboo was breaking down by Hiroshige's day. Shops of this type were always located in rather disreputable places and would offer boar, monkey, raccoon-dog, otter, fox, wolf, and weasel. According to Ishii Kendo, this particular shop was still in business at the same location in 1919, but was offering chicken and beef, meat of domesticated animals. It is theorized that this print may be the work of Shigenobu, the future Hiroshige II. 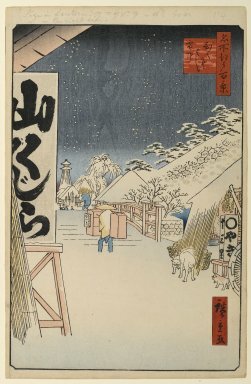 The style and content do not appear to be characteristic of Hiroshige; the empty space in the foreground and the placement of the snowflakes in the sky offer a sense of incompletion.